It was just a question of time. 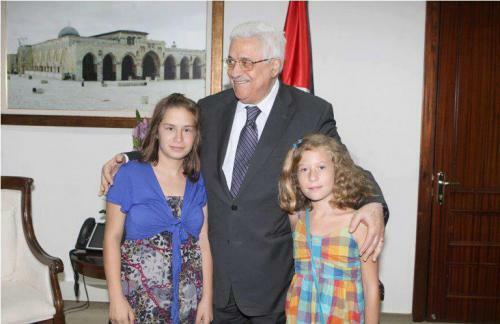 Two months ago, CAMERA described in a Times of Israel Op-Ed (“Cheap Shots: Palestinians Put Kids in the Line of Fire“) how A’hd Tamimi, 11, and her cousin Marah took a lead role in the Nabi Saleh demonstration against the Israeli army. The weekly clashes often result in violence. 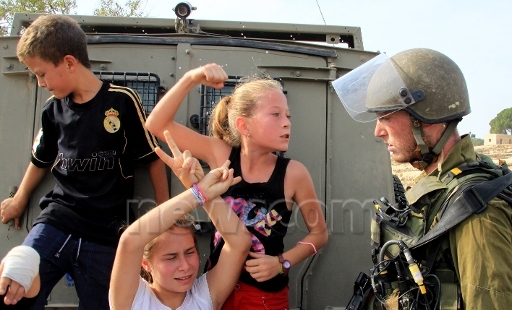 Photographs of the girls being restrained by Israeli soldiers (see below, for example), subsequently were featured in Australian newspapers illustrating alleged Israeli abuse of Palestinian children. A senior IDF source told Ynet that intelligence indicates that pro-Palestinian activists pay Palestinian children from Nabi Salih and the nearby villages to confront the soldiers. The weekly protests in the areas used to involve hundreds of people, but over time the numbers have dwindled to just a few dozens. According to the officers, the majority of protesters are foreign pro-Palestinian activists. “The soldiers are briefed on the fact that these protests are staged for the sake of provocation, so that they could be filmed acting violently and so that those videos could be distributed worldwide in an effort to harm the IDF’s image,” the officer explained.